Rocky is a three year old long haired German shepherd who is loves to play fetch. 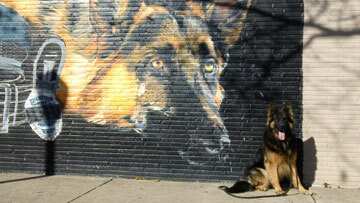 This picture was taken in Virginia Beach, VA at the corner of 21st and Atlantic Ave where there is a mural of a retired K-9. Just one look at his pic & I was blown away. That's a beautiful, healthy , handsome boy you've got there....Just shows how much love you give him! Thanks for sharing this with us & God bless! Your boy Rocky is a handsome GSD. Massive structure, strong built and powerful! He is your protector and God Bless him. Take care of your boy and he will take care of you!